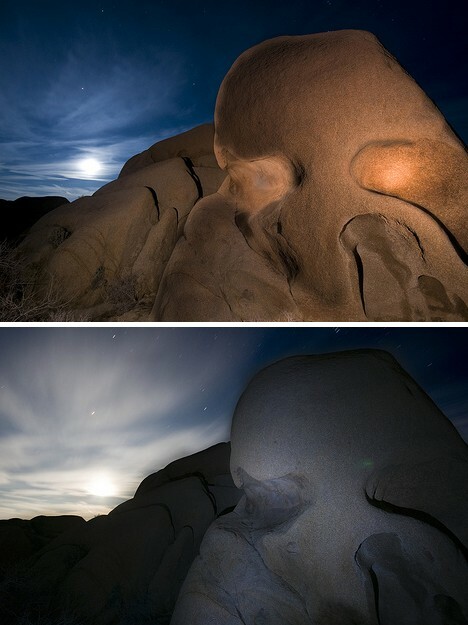 Skull Rock, a naturally weathered granite rock formation located in California’s Joshua Tree National Park, stares out across an otherworldly landscape of shattered boulders, tumbling tumbleweeds and eerily twisted Joshua trees. 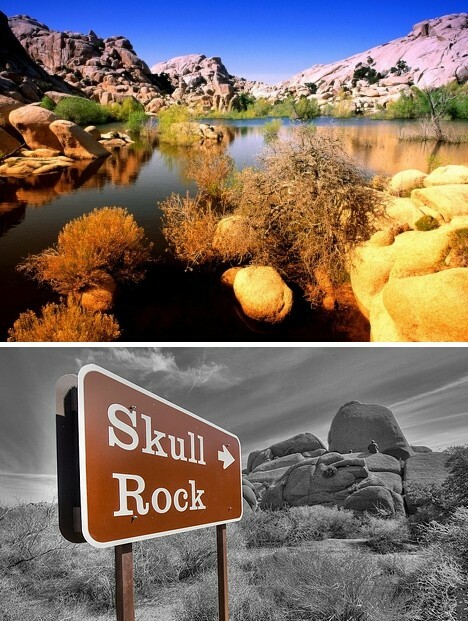 These 13 spook-tacular views of Skull Rock highlight the strange anthropomorphic symmetry that causes stone to resemble bone. 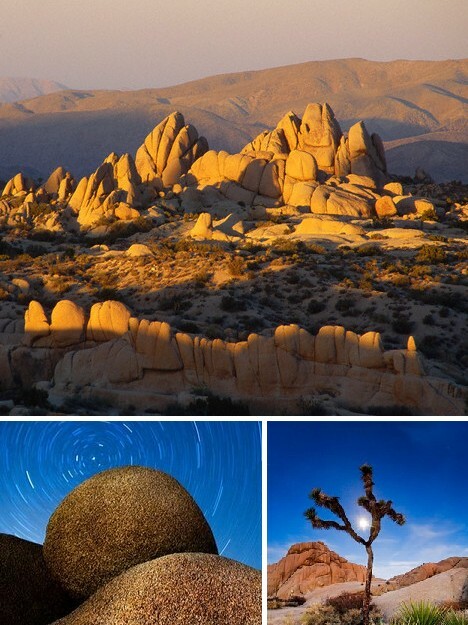 Joshua Tree National Park was established in 1994 though the area had been designated a U.S. National Monument since 1936. 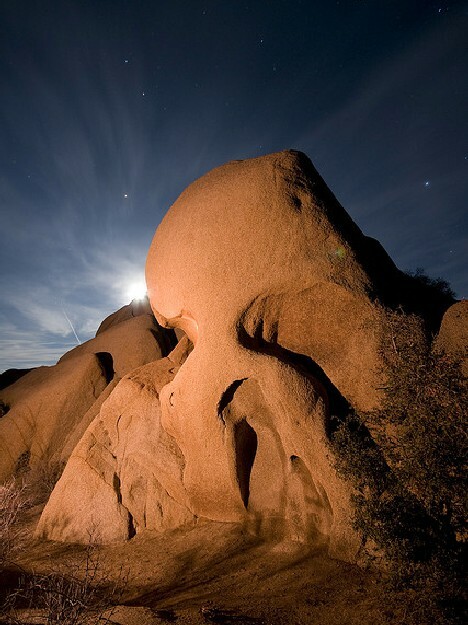 Located in southeastern California, “JTree” (as the locals like to call it) spreads over parts of Riverside and San Bernardino counties and includes portions of two separate deserts, the Little San Bernardino Mountains, and part of the San Andreas Fault. 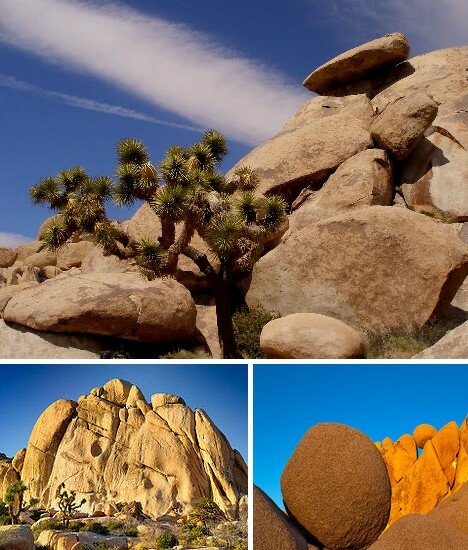 The park boasts several unique distinguishing features, mainly many Joshua Trees (Yucca brevifolia) and weirdly rounded rock formations that are popular with hikers and rock climbers. 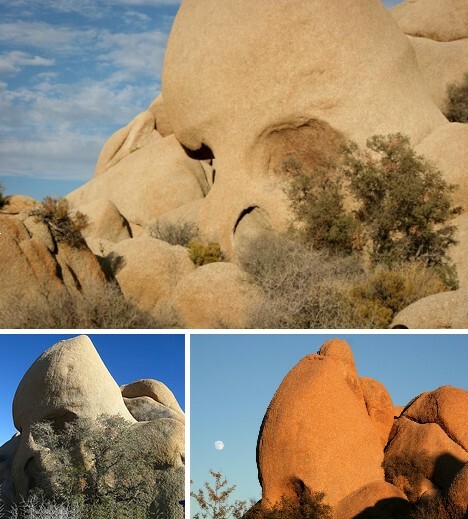 Some of these odd outcrops have been given names based on their outward appearance, such as Cap Rock (above top), Old Woman Rock (above left) and the Giant Marbles (above right). 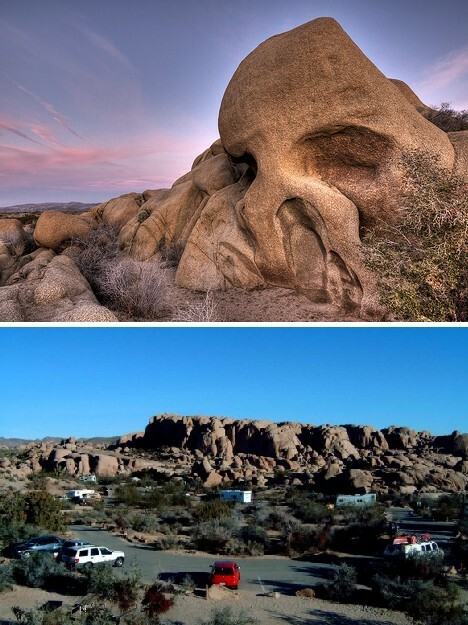 Skull Rock is one of the easier noteworthy rock formations to get to, being that it’s located at the east end of the Jumbo Rocks campground. Not that there’s anything wrong with an extended hike but families, the elderly and those suffering from disabilities will welcome the somewhat surprising convenience. Drivers entering Joshua Tree National Park along Park Blvd. 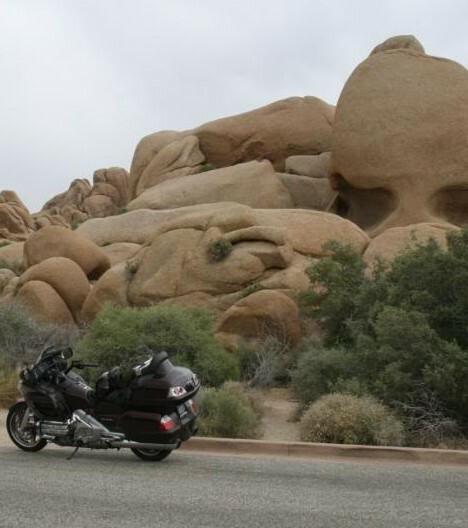 can see Skull Rock from the road and once parked, the feature is just a few steps away. Most of the rock formations in the park are granite that solidified out of a molten state over 80 million years ago. Since that time, they have been slowly eroding due to the action of percolating groundwater at first; then wind and rain once the granite became exposed to surface weathering. Considering the hardness of granite and the arid conditions typical of the region, this is a very long, exceedingly incremental process. 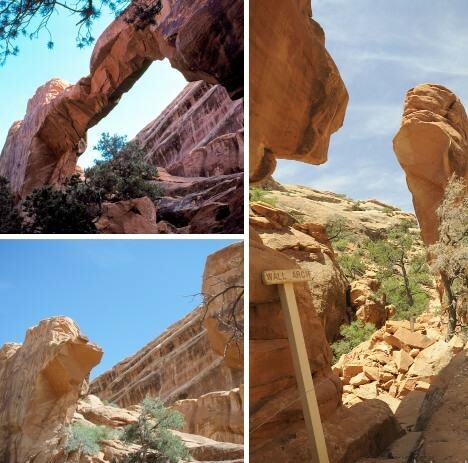 In contrast, the weathering of the much softer sandstone in places like Arches National Park (above) is much faster, geologically speaking – as is their inevitable demise. 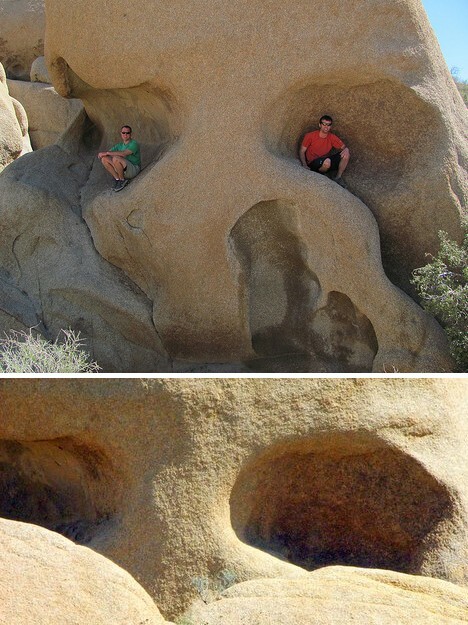 The granite that makes up Skull Rock and other similar formations in Joshua Tree National Park appears smooth and rounded from a distance but is actually rough to the touch; a by-product of non-glacial weathering combined with nature’s own sand-blasting. By comparison, granite scoured by glaciers or tumbled in rivers and streams presents a much “cleaner” face as the various mineral crystals have been worn flat. This benefits formations such as Skull Rock since they can survive a much greater amount of wear & tear brought about by human activity. 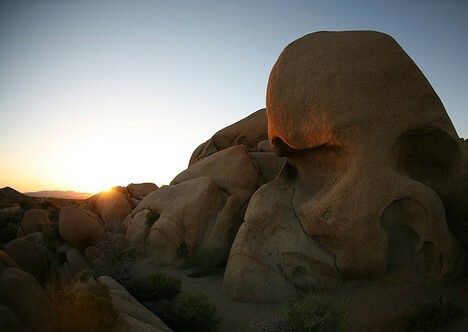 Skull Rock is a favorite subject for photographers both amateur and professional, and due to the changing interplay of sun and shadow around the formation’s “eye sockets” and other skull-acious features it’s hard to take the same picture twice. Even at the height of the day when shadows are at their minimum (above, top), the scene takes on an appearance of timeless desolation with only patches of scrub or the occasional skittering lizard to break the visual spell. 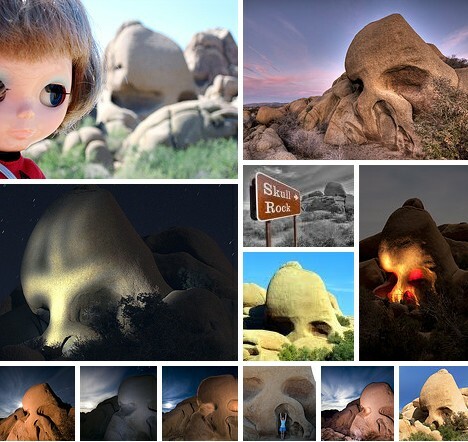 It’s at dawn or dusk – especially dusk – that Skull Rock takes on an ominous atmosphere, a certain ancient presence, a sense of impending doom… at least that’s what the minds of the more imaginative among us might project. Add some creative accessory lighting, adjust the exposure and maybe even tweak the image with Photoshop and Skull Rock really, well, rocks! 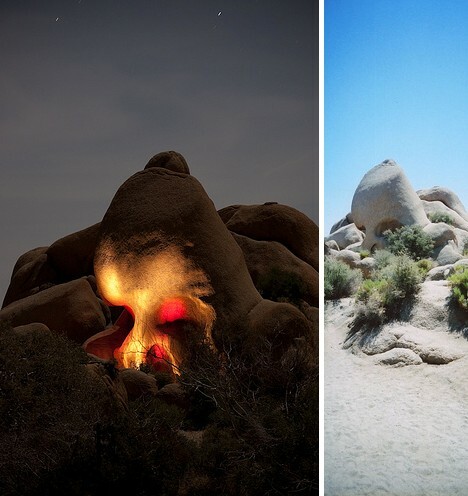 The above photos taken by Thomas J. Sebourn are perhaps the very best of their kind, endowing Skull Rock with a delightfully disturbing aura of benevolence and, er, badassness, to coin a word. One can easily imagine pre-Columbian tribes conducting ritual sacrifices to the Great Skull Spirit by the light of the moon! 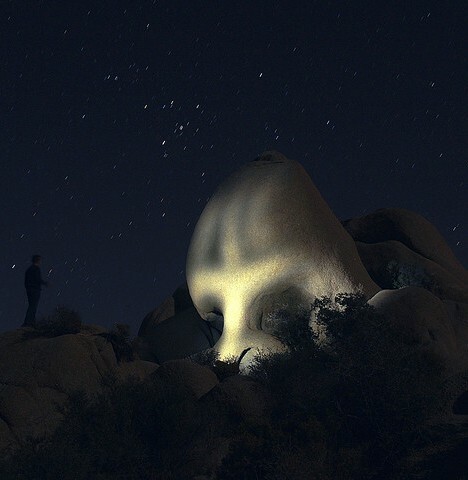 Jeffrey Sullivan and Juli are two other photographers who have enhanced Skull Rock’s chilling visage with some skillful light painting and image processing. The two photos above illustrate two different sides of the formation – not right or left, but good and evil. 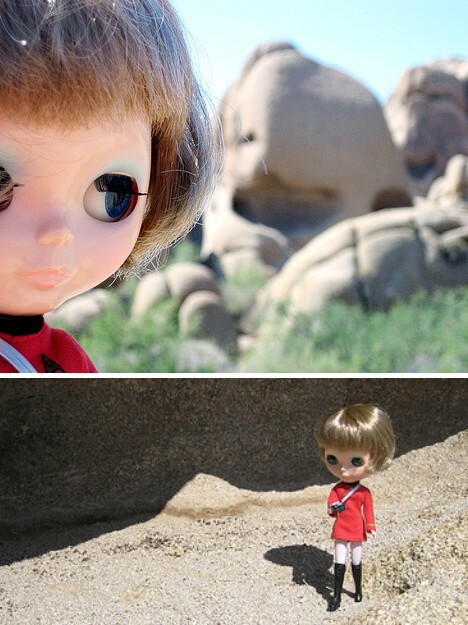 “To blithely go where no one has gone before…” Combine Skull Rock, Star Trek, and Kenner’s 1972 big-eyed, big-headed Blythe doll and you’re pushing awesomeness far beyond the final frontier. 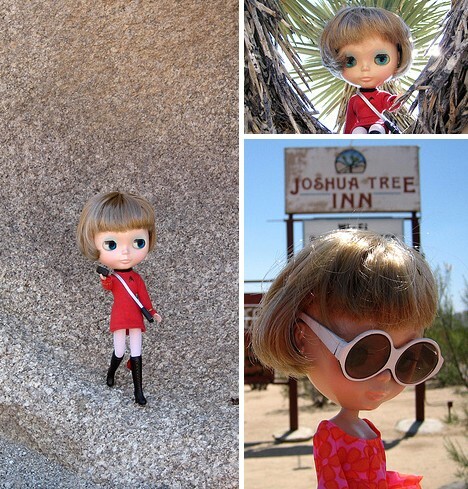 Blythe has enjoyed a renaissance in the past few years as Japanese toymaker Takara Tomy has re-issued the doll to the delight of hobbyists everywhere… even in California’s high desert. The hobbyist photographer who took the above images meticulously outfitted Blythe in classic Star Trek TOS regalia including a Federation communicator badge and a tricorder. As for the choice of a red uniform… well, we all know what THAT means. The so-called “Infinite Monkey Theorem” posits that a monkey typing away randomly on a typewriter (or keyboard) for infinity will, sooner or later, type out the complete works of Shakespeare. This is just a theory, of course, because monkeys don’t live an infinite number of years. 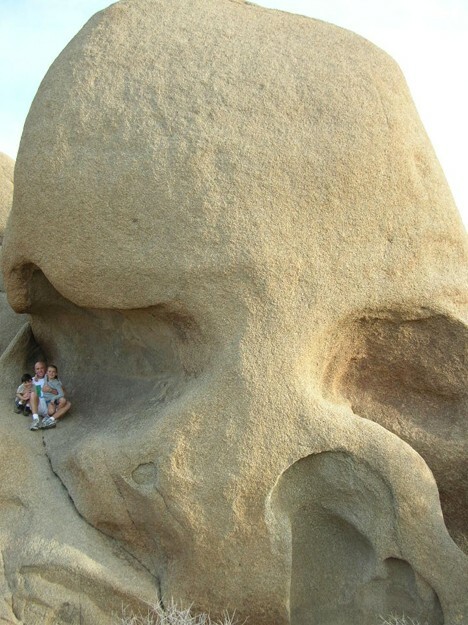 A variation on the concept does exist, however, in the form of Skull Rock. Randomly acting forces of nature have, over the past 80-odd million years, managed to carve out a reasonable representation of a human skull from a massive congealed bolus of volcanic granite. Not too shabby, especially considering that most of the carving occurred before the first recognizable human walked the Earth. Imagine what it’ll look like in another 80 million years… Nature, you really scary!